Miami’s Biscayne Corridor is home to Icon Bay by Arquitectonica and the Related Group. 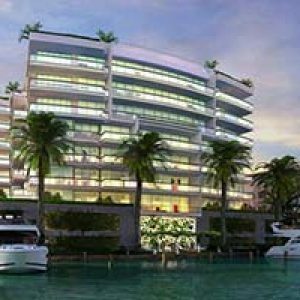 It’s a stunning forty story building that will provide gorgeous residences in the bustling atmosphere of Miami. Located at 428 NE 28th Street, the units are available in 1, 2, and 3 bedrooms (including penthouses), and come in a range of 1093 to 1758 square feet. Near Edgewater, it promises residents a life of luxury and exclusive living. Every residence will provide gorgeous views of Biscayne Bay and Miami Beach through its floor to ceiling glass windows and on the open glass railing balconies. They have 9 foot ceilings for an open and spacious living space, while penthouses promise up to 11 foot ceilings. Each unit has private elevator access and one assigned parking space for convenience. The gourmet European kitchens have stainless steel modern appliances, including a built in oven and microwave, dishwasher, and designer faucets with pull out sprayers. The tile flooring is imported porcelain, giving the residences a classic yet modern feel. The kitchens and bathrooms have premium European styled cabinetry for a gorgeous ambiance, and come equipped with glassed in showers and large soaking tubs for relaxation at home. The property boasts over 400 feet of beach access for residents, and has stunning waterfront sculpture gardens and walking paths. Icon Bay has a 24 hour concierge staff and 24 hour valet parking services for ease of living. A beautiful waterfront deck allows the resident to relax in the infinity edge pool, private cabanas, or enjoy the snack bar with towel services. The fitness center also allows for stunning views of the water, and has top of the line equipment, as well as steam room and sauna, personal trainers available, lighted tennis courts, and yoga classes. A clubroom with billiards and game room is available for use by residents, as well as their own coffee bar on the property. The location is perfect and puts the resident at the heart of peaceful activity. To the east is bustling Miami Beach, and the property is close to Biscayne Boulevard, which will take you to the downtown area of Miami. You can also visit the nearby Biscayne Marketplace for live music and shopping. There are numerous schools, preschools, and daycares nearby, making it the perfect place for a growing family. These units will fill quickly, as Icon Bay will quickly become the talk of the neighborhood. Don’t miss out on this fantastic living and investment opportunity!